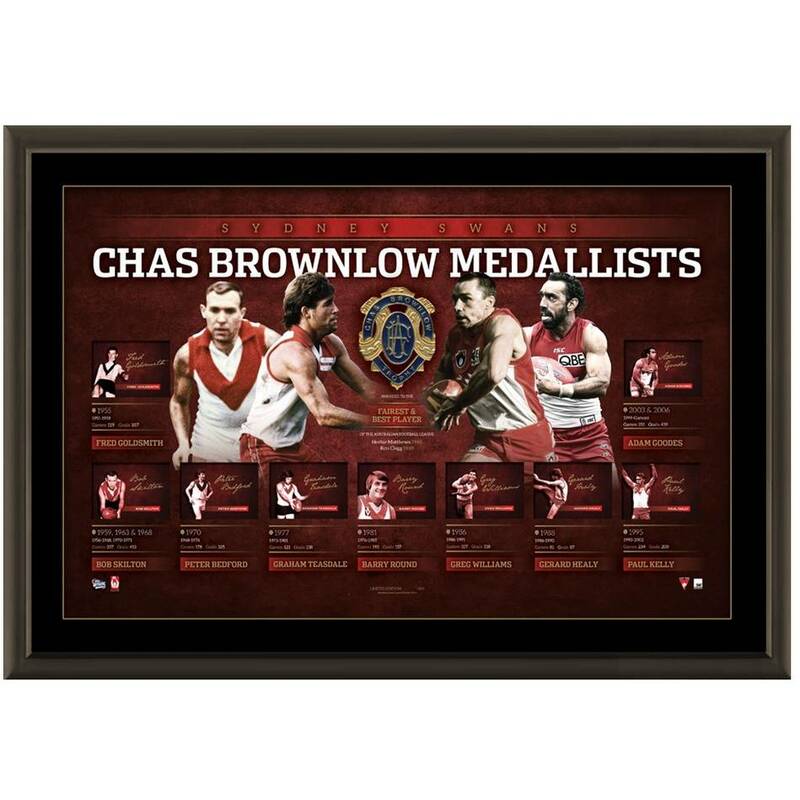 Official Memorabilia and the Sydney Swans are pleased to pay tribute to the history of the Chas Brownlow Medal and its esteemed recipients. It’s a wonderful initiative being supported by past greats of the game, with proceeds of each sale donated to the Brownlow Fund to assist former players that have fallen on hard times. This deluxe lithograph pays tribute to Sydney’s history of Chas Brownlow Medal success, and is personally signed by Sydney/South Melbourne superstars Adam Goodes, Bob Skilton, Greg Williams, Gerard Healy, Paul Kelly, Barry Round, Graham Teasdale, Peter Bedford and Fred Goldsmith. Personally signed by Adam Goodes, Bob Skilton, Greg Williams, Gerard Healy, Paul Kelly, Barry Round, Graham Teasdale, Peter Bedford and Fred Goldsmith.